Physical inactivity seems to be reaching pandemic proportions. People are becoming more obese and less physically active at an alarming rate, and physical inactivity is a significant societal and personal burden in terms of economic and health costs. Nurses are ideally placed to motivate patients and promote physical activity. This article examines the benefits of physical activity, and explores emergency nurses’ role in promoting regular exercise. It also outlines physical activity recommendations and suggests a starting point for promoting healthy exercise to patients who attend emergency departments. 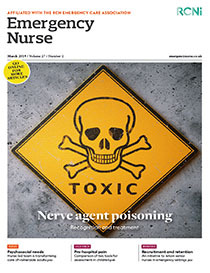 Share article: Physical activity: is it time for emergency department nurses to step up?